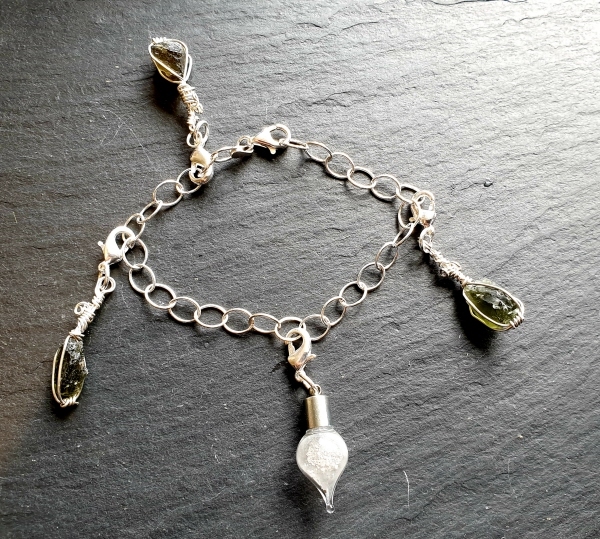 This is a gorgeous little solid silver charm bracelet with a selection of Moldavite Charms and set off with a Glass vial containing real Moon dust. It has three piece of genuine Moldavite individually wrapped in sterling silver wire, and one glass vial containing real Moon dust. Each charm has a sterling silver lobster clasp with which it can be clipped on and off. This means the bracelet can be customised by you over time. If you chose to you could buy more charms or add charms from other bracelets to this one. The bracelet is solid sterling silver and measures 7.5 Inches in diameter. This is a very standard size and should fit pretty much ANY wrist. The bracelet will be sent beautifully boxed in a high quality padded jewellery box and come complete with signed certificates of authenticity for whichever meteorite type is used in the bracelet. This is a Saharan Stone Chondrite meteorite skillfully wrapped in sterling silver wire. 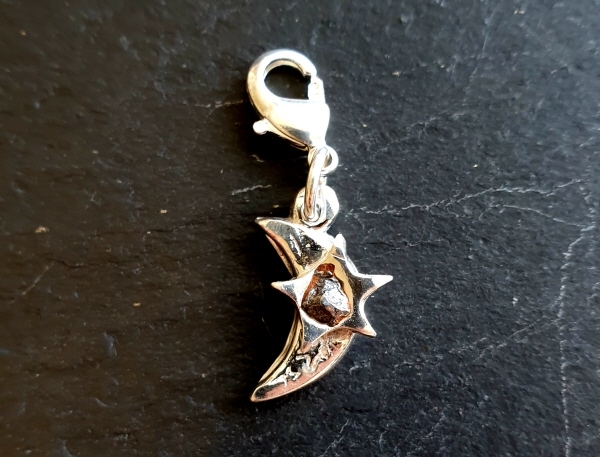 The charm you recieve will not be this exact one, but made with a unique stone meteorite weighing 2-3 grams. The charm is hung with a sterling silver lobster clasp so can easily be removed or moved around on the bracelet and makes it easy to customise your bracelet over time. Each Charm comes with a signed certificate of authenticity complete with colour photos and a unique holographic serial number. This is made with a piece of real Moldavite - skillfully wrapped in sterling silver wire. The charm you receive will not be this exact one, but made with a unique piece of Moldavite weighing 2-3 grams. Not technically a meteorite but an IMPACTITE. This is made with a whole iron meteorite fragment - skillfully wrapped in sterling silver wire. Fragments of iron fell over a HUGE area and are still being collected today. This is made with a Libyan Desert Glass fragment - skillfully wrapped in sterling silver wire. This is made with a Solid sterling silver star set with a fragment of iron Meteorite. The charm you receive will not be this exact one, but made with a similar but unique fragment of the iron meteorite. This is made with a Solid sterling double silver star set with a fragment of iron Meteorite. This is made with a Solid sterling silver heart set with a fragment of iron Meteorite. This is made with a Solid sterling silver crescent set with a small silver star with a fragment of iron Meteorite in it's centre. This is made with a Solid sterling silver disc set with a fragment of iron Meteorite.